One of the largest secret Mithraic temples in Rome is hidden next to the famous Circus Maximus. Discovered in 1931 as part of Rome’s fascist-era building projects, the small subterranean space was once dedicated to the mystery cult of the god Mithras. Although several mithraeums have been discovered throughout the ancient holding of the Roman Empire, including sites in London, and several in Germany, France, and Hungary, little is known about the actual religious practices of the movement’s followers. The Mithraic Mysteries emerged and gained popularity throughout Rome between the 1st and 4th centuries. The cult and religious sanctuaries were open only to initiates, and their rituals secret. The central imagery is of the god Mithras slaying a bull, a motif known as “tauroctony,” found in most if not all mithraeums. Some trace the origins of the cult to the Iranian god Mitra, based on statements made by 3-4th century AD philosopher Porphyry, but some question whether he actually knew what he was talking about. In any event, the cult died out at the end of 4th century as Christianity began to gain momentum. 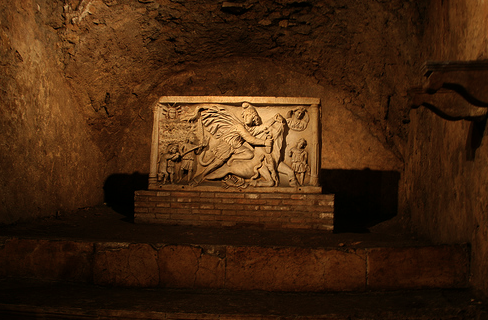 Mithraeums were often underground, sometimes built into natural caves. 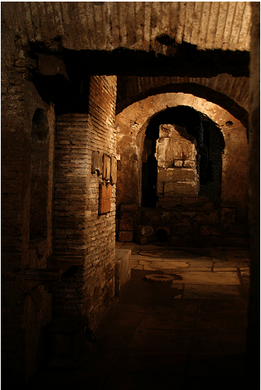 The central chamber was dark and windowless, in contrast to the open and bright structure of most early Roman temples. The structures are small and intimate, designed to hold only 30-40 people as a place of secret ritual prayer, sacrifice, and ritual meals of bread and wine. 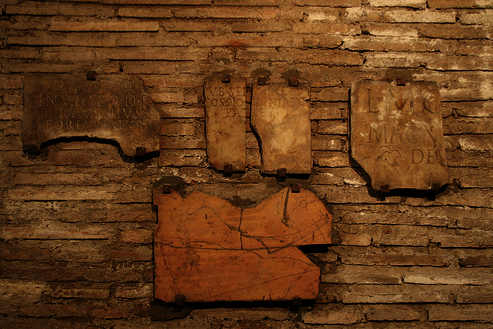 The mithraeum under Circus Maximus is accessible by appointment only. The site dates to the 2nd century AD, and features five parallel but separate chambers with a central sanctuary paved in white marble, with two niches for statues of Caute and Cautopates, and a place of honor which would have held a statue of Mithras.